UK: FoundOcean is testing its latest marine growth prevention (MGP) units on a UK offshore wind project's jacket foundations and says the units could save developers $2.1 million over ten years per jacket. 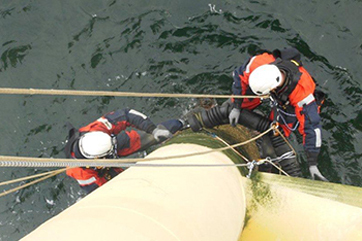 The latest MGPs, improved versions of units installed in 2013, are designed to prevent the growth of marine life on turbine foundations. Two units have been installed for an extended trial period on jacket foundations in the Liverpool Bay area of the Irish Sea. FoundOcean is targeting the offshore wind sector with the device, following research from the Malaysian offshore oil and gas industry that indicated its deployment could save up to $2.1 million per foundation over a decade. A FoundOcean spokesperson said the savings in Europe's offshore wind sector could be even greater, due to its higher costs for labour and vessels. Using divers to clear marine growth from jacket foundations cost costs $3 million over ten years, according to the research. Heavy marine growth can damage the foundations by adding static weight. The MPG units use the sea current or waves moving along the jackets to prevent the build up of microbial slime, which can lead to more damaging growths such crustaceans and seaweed.